HIRE A CARICATURE ARTIST FOR YOUR NEXT EVENT! One of Canada’s top Caricature Artists, Pablo draws caricatures in Ottawa, Gatineau, Montreal, Toronto and all areas in between. He has been caricaturing people since 1980s. He has done Caricatures on four continents of the world and is constantly in demand as an artist, an instructor and a graphic facilitator. With a background in animation, industrial design and illustrator, Pablo creates amazing cartoon likenesses of your guests right in front of their eyes. He sketching 10-15 guests per hour. Pablo caricatures at trade shows, corporate events, Christmas parties, festivals, even at smaller house parties and private events. Your guests will love being able to take home a caricature that they can proudly hang up on their wall and cherish. 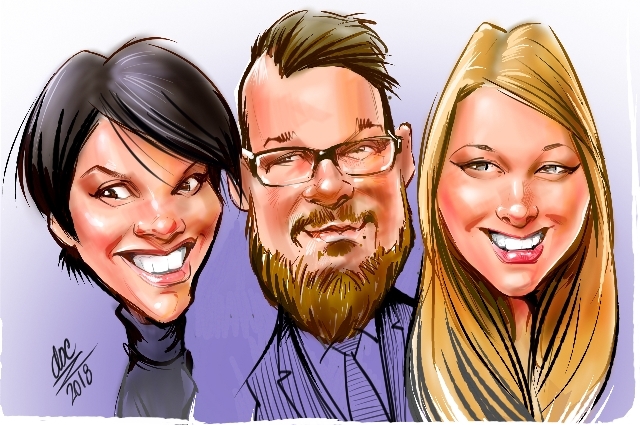 Pablo has drawn caricatures for weddings, real estate agents, open houses and small business promotions. Pablo happily works on behalf of a sponsor or at a festival for you. He can predesign a logo or image form the sponsor right onto the paper that he’s drawing caricatures on..That way each person who gets an amazing caricature knows who to thank for the caricature drawing they got! Please send an email to look@ottawacaricatures.com. We usually reply within 5 to 10 minutes.